So, unless you live under a rock (or took a hiatus from social media over the last couple weeks), you may have seen a few posts about something called Our Maker Life (OML). 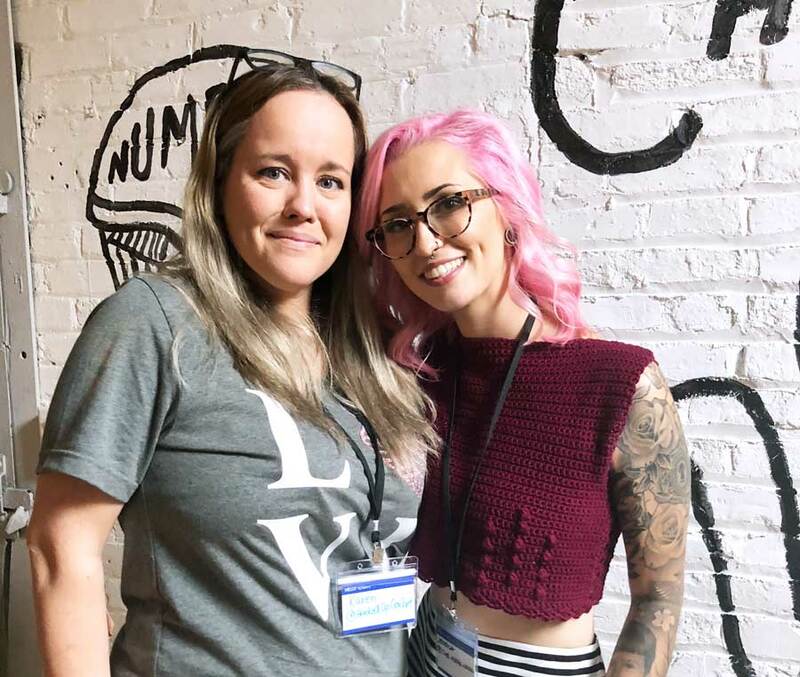 OML was founded by a team of Makers a few years back and over the last few years, they have been able to host a fiber lover’s dream event, held once a year. 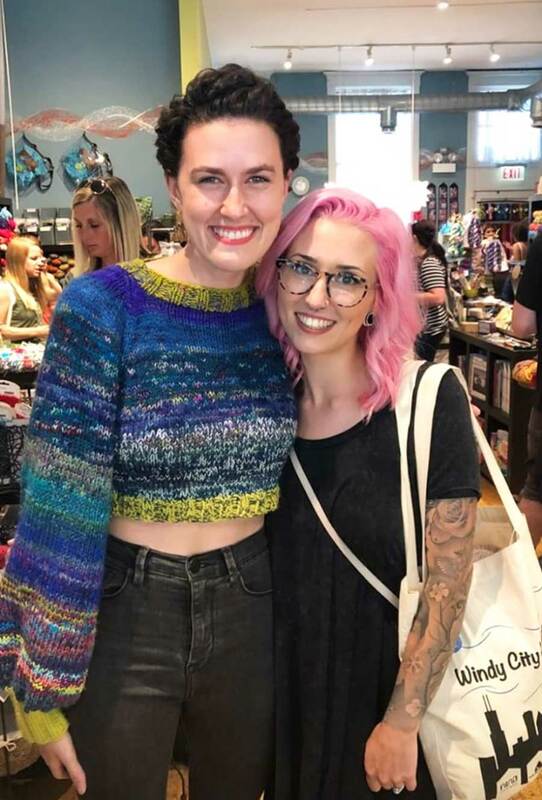 Imagine all of your favorite Instagram knit and crochet friends all in one place meeting in real life and being sent home with swag so squishy and dreamy that you’ll be pinching yourself to make sure you’re not actually dreaming. 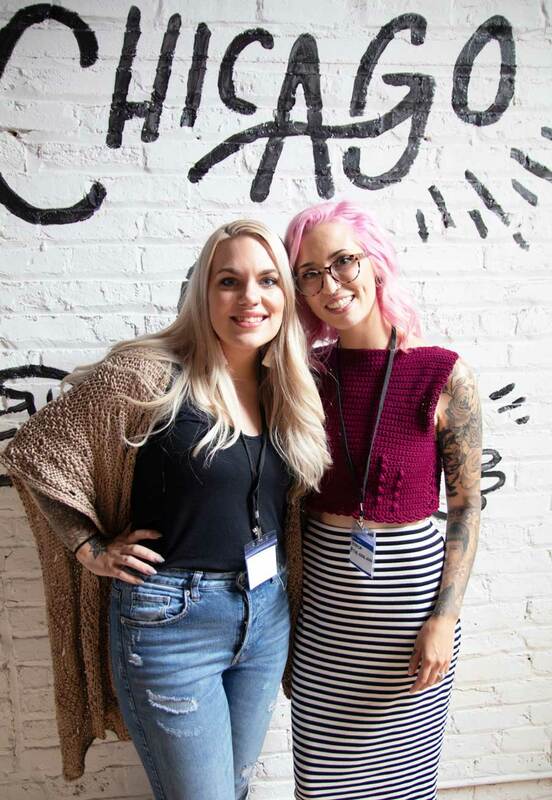 I was one of two keynote speakers, with the other being the one and only Brittany from Bhooked. She had such a powerful message inspiring the audience to go after their dreams and gave intentional insight on how to make that happen. 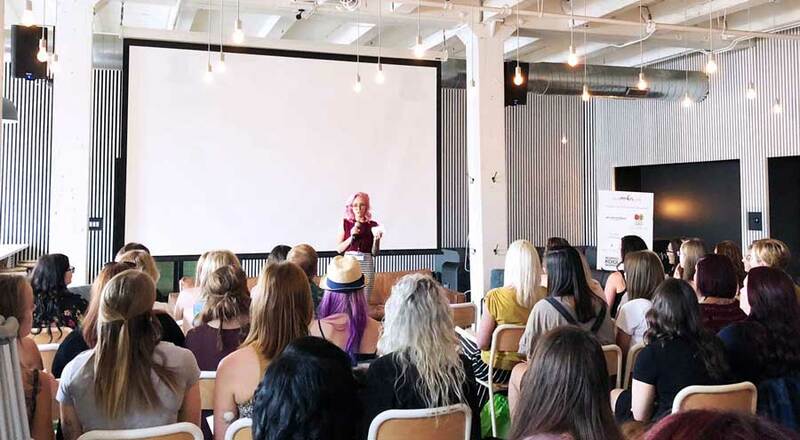 She shared her successes, her failures and what she’s learned from it all. It definitely left me feeling inspired to get my business in check and take the time to hammer out the nitty gritty because it is so absolutely worth it! 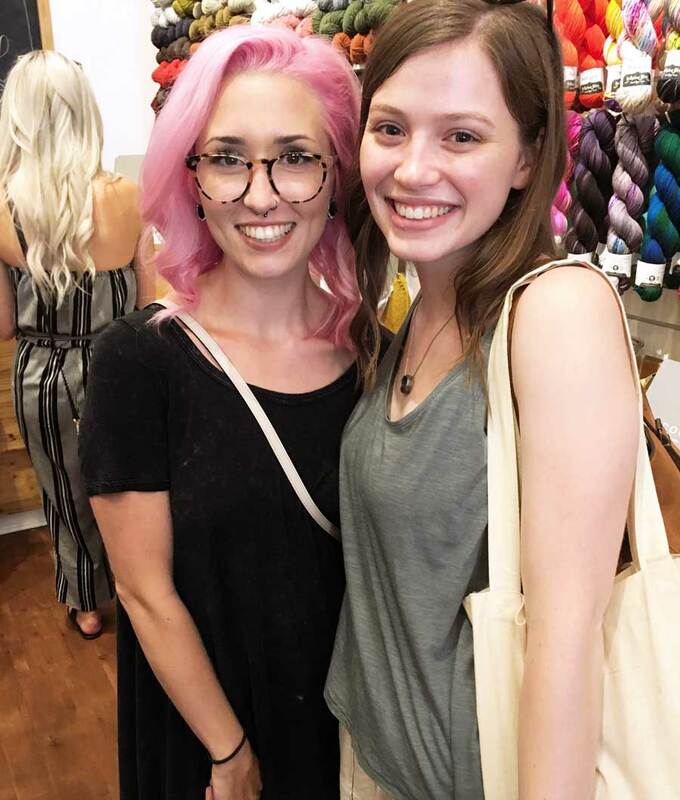 I finally got to meet Brittany after years of following her work and collaborating twice on her Podcast! I chose to share a bit more of my story, as well as a bit more of my heart. I felt so called to speak about fear and how it has pierced my life in numerous ways. How fear stopped me in my tracks and told a firm hold of my life. But I also shared the reigning win of letting go of the fear that crippled me and experiencing the beauty in what happens after doing so. We are all here to live as exactly who we are and to live a life in our self-made lies and “un-truths” only prohibits us and has us hiking uphill instead of sliding down. 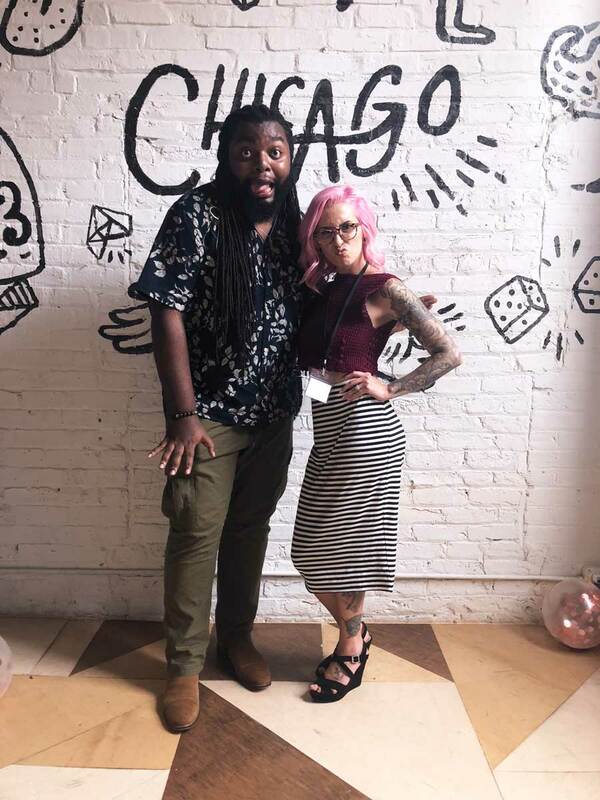 It was so much fun because I was able to travel to Chicago with one of my best friends, Vincent from @knot.bad, and we managed to find some IG friends who had space in their Airbnb for the two of us. Mind you, there were then a total of TEN of us in this darling apartment but only four of us total knew that Vincent and I were going to room with them. When we finally got to Chicago and got settled in the space, a few hours went by before our first set of roomies came “home”. 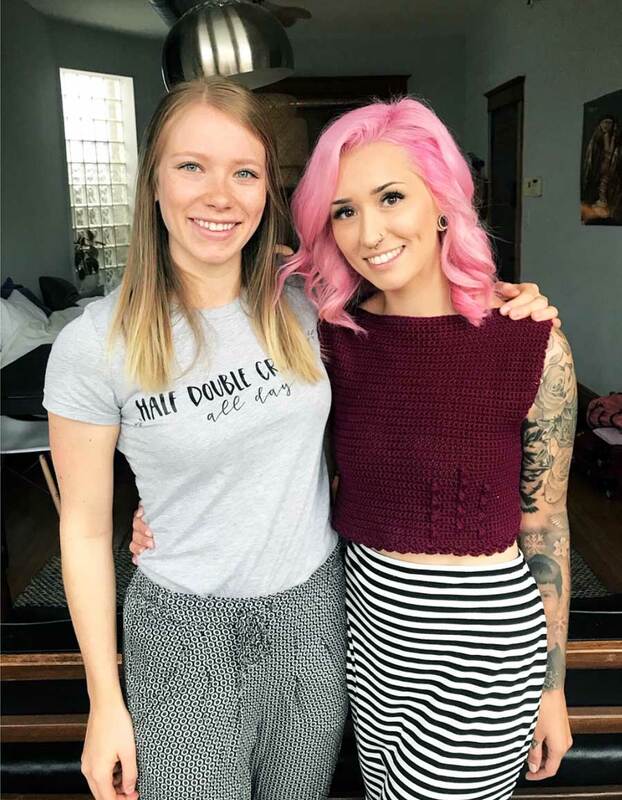 Both Lauren from @amenagerieofstitches (who actually just released her very first book, Whimsical Stitches, which is a crochet pattern book FILLED with the most darling amigurumi characters! You NEED a copy STAT) and Courtney from @ilovetinderbox knew we were staying, but Zoe from @knitbyzoe did not know. When they walked in, Vincent and I hid around the corner and videotaped her reaction when she finally found us. It was such a fun surprise!! In our Airbnb, we also had Lee from @coco.crochet.lee, Mollie from @whiteowlcrochet, Lauryn from @lovenestcreative, Jennifer from @jms.handmade and Holly from @knittermeandcompany. 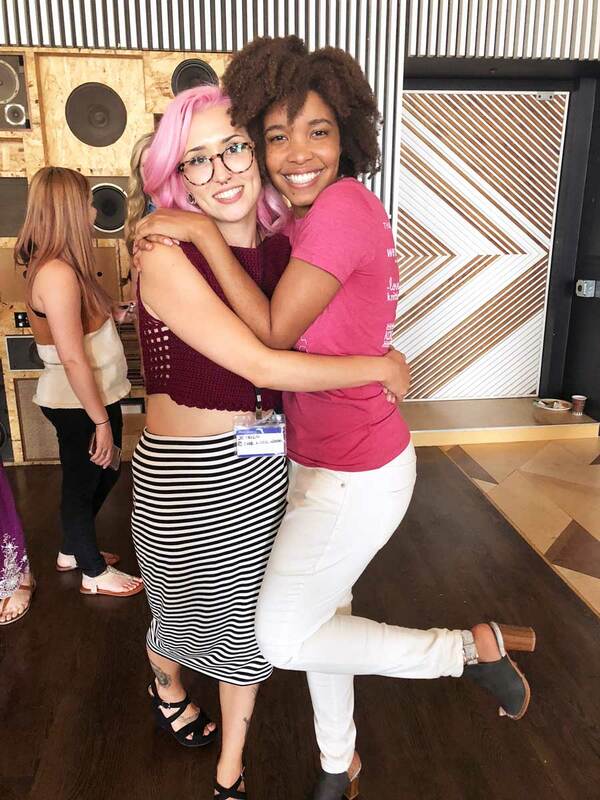 Me and my roomie, Zoe, right before we head down to Low Res Studios for the Our Maker Life event! We arrived on Thursday and kind of took it easy. 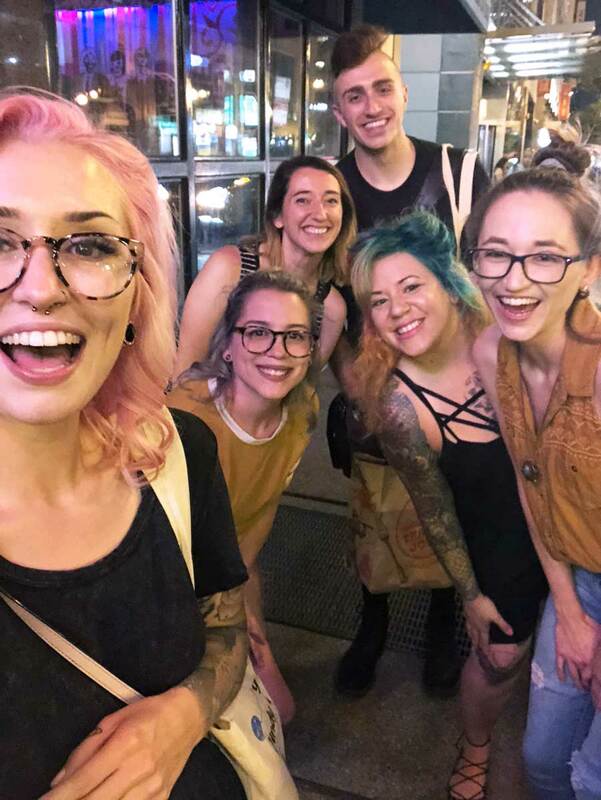 We eventually made our way downtown and went out for some delicious pizza and wine with our new roommates and, on the way home, even ran into some friends (@shannoncreates, @a_cute_design and @knittingbydarian) so we obviously had to run across the street and give hugs before heading home. Friday was such an amazing day. 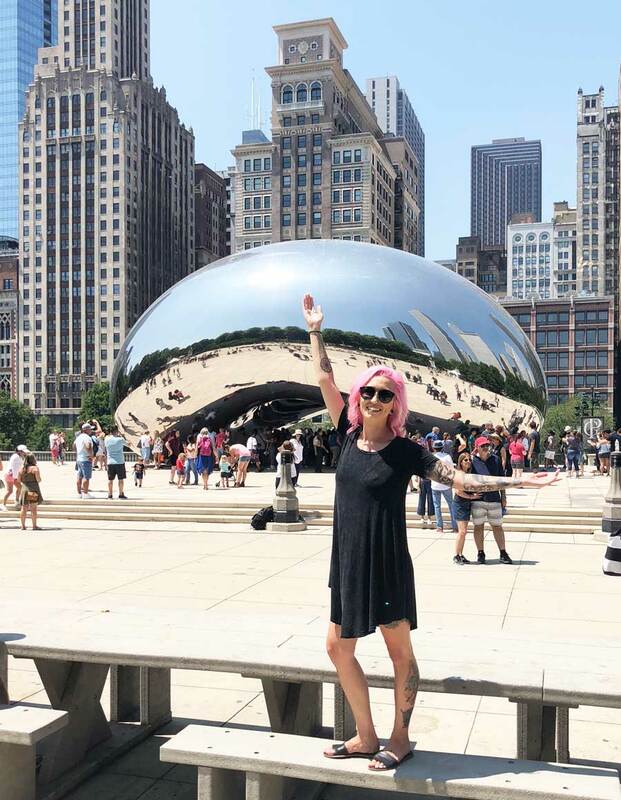 We found ourselves downtown early afternoon and explored Millennium Park and, of course, took some fun photos at Cloud Gate, or the “bean”. We also slipped off our sandals and cooled off at the Crown Fountain and watched these huge sculptures become portraits of people who spat water out at others. It was just so fascinating!! I loved how much art there was riddled throughout the city. From the detailed and architectural buildings contrasted against the metal and glass skyscrapers, it was just so gorgeous and creatively provoking. Park (@parknknit) and I during the Windy City LYS tour! Goal moment... Getting to chat with Emily from @thebluemouse_ kind of gave me life. "The bean" in Millennium Park, downtown Chicago! 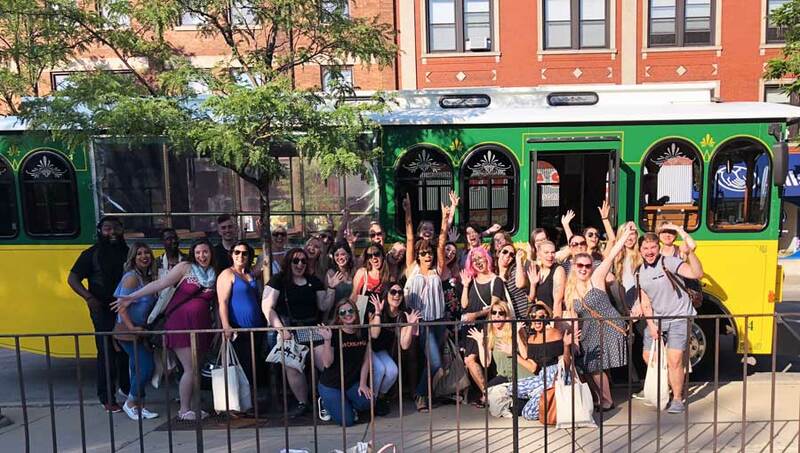 Windy City LYS tour - so much fun!! In addition to visiting these stores, it was also the precursor event for Our Maker Life. All attendees were able to get first looks at the people we’ve been following for years, got to immerse ourselves in the magic that happens at OML events before the crazy happened the next day. It was so amazing to be in that smaller group and get to connect with others in such an intentional way. We have all been friends online for all different lengths of time, some for years, and while getting to hug and connect with one another on a human level, we all were also surrounded by quality fiber and good attitudes. It was such a perfect way to dip our toes and warm up to what was waiting for us just hours later - the actual Our Maker Life 2018 event. I woke up that morning a bit groggy and tired and in desperate need for coffee, but I found myself cool as a cucumber and not nervous at all. For someone who battles social anxiety often, it was such a freeing and enjoyable morning despite knowing that it was all about to get insane. Jewell from @northknits and I after everything got all wrapped up! I remember finally getting a bit nervous as we pulled up and entered the building to find DOZENS of others already lined up and ready to go into the venue. I mean, it’s a bit weird walking into a room where most everyone knows who you are and you have no idea where you’re supposed to be, what you’re supposed to do.. so I just kind of ran down the hallway waving and freaking out just trying to find Jewell so she could tell me what to do. Ha! BUT YOU GUYS!!! So many magical things happened at the event, and in the whole weekend, but one of my all time favorite moments was getting a Facebook message from my friend Karen from @hookedupcrochet. Just so you all know, we have known each other online for like EIGHT YEARS. We were pregnant at the same time, learned to crochet at the same time in the same Facebook group, her oldest and my youngest have the same birthday while her youngest and my oldest share the same birthday as well. This woman is an admin in my Facebook group and has just been one of the most insanely supportive and encouraging women I’ve ever met. I have a good amount of pieces she has made and sent to me and my children. Karen is just a wonderful human. Anyway, she messaged me that she had finally made it and was at the back of the line. The SECOND I saw the message, I bolted out of my current conversation and ran as fast as I could in high heel wedges and wrapped myself up in her the second I saw her. It was such an amazing moment to finally get to hug and feel and BE with someone you have loved for so long. I am just so overjoyed that we were finally able to meet after so many years of being so involved with one another. How freaking cool is the internet, guys?! One of my most memorable moments.. meeting Karen from @hookedupcrochet for the first time after being online friends for eight years! After we wiped the tears, I went back in and mingled around and met countless others, took a ton of photos with incredible Makers and ate some yummy breakfast foods while chugging that coffee. Eventually the event started and after Jewell said her introduction, Brittany from Bhooked went onto stage and knocked it out of the park. Anyone wanting to do this crafting thing professionally was left with concrete ideas on what to do to become successful in their endeavors. She touched on fear and how it prohibited us from getting further. She discussed the importance of being intentional and disciplined - all things I struggle with and really felt a kick in the rear hearing it from her. She was so calm, collected and well versed in her content. She is a straight up BOSS. Once Brittany finished up, I met her in the back and got mic’d up for my turn. Still, I have no idea why I wasn’t caught up in nerves, my stomach was hurting, I wasn’t scared. I was ready. However, once I finally stood up on that carpet in front of 100+ others who ranged from friends, to fans, to sponsors, to just straight up peers… I could NOT control the shake of my hands or the shake of my voice. I’ve never done public speaking before but gave myself enough grace and flexibility and made one HUGE no-no when it comes to public speaking. I seriously printed off my speech word for word and glued it to my index cards, in the event I wanted to read off of them. I know this is terrible, but for me, my mind doesn’t work the same when I talk versus when I write. When I close my mouth and let my mind talk, it is much more eloquent and can relay my feelings much more deeply than having to think quick with my mouth. Yes, I read off of my cards for a good majority of it, but that’s ok. I was so nervous, guys.. I think it was VERY clear how unpracticed I am when speaking to a crowd, but I think that actually contributed to my message. To be honest, I prayed before I went up to speak. I sat in my chair and closed my eyes and prayed that I wouldn’t be nervous, that I’d get my message across and that I’d be able to be and do exactly what He had intended. But I was still nervous. And shaky. But in the end result, I’m so so glad. I was able to prove how human I am. I was able to instill the exact things I was speaking about, and be a literal example of the things I was sharing. God is so, so good. After my speech we took a little break and had time to mingle. At one point after talking with a dozen Makers and having them share with me how much they enjoyed my speech, that it was what they needed to hear and how it had inspired them, I felt so achingly overwhelmed and stepped out to the hallway and just broke down in tears. I had felt so unworthy for so long of being put on this platform, for being this big voice. But I had done it, I was able to stand up and be strong and share my life and experiences to hopefully encourage others to follow their own paths and journeys and to stay true to themselves and all that was meant to become their reality. This made me just EXPLODE in emotion and I was so excruciatingly grateful for so many things in that one moment. I prayed and thanked God for all that was happening. What a story of redemption. 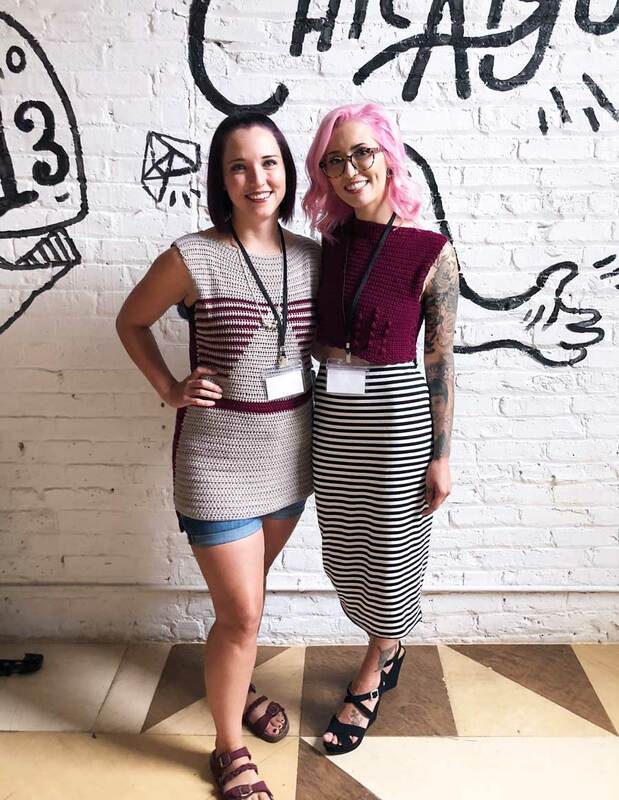 Tearsha from @light.of.a.maker wearing my Nolan Top design from my We Are Knitters collection!! You guys, I sat there and just embraced her while bawling as she prayed with me. I had never met her before, but there was this deep connection that you just cannot deny was there. What. A. Moment. Later in the event we listened to reps from Love Crochet and Love Knitting share how they love to promote and work with Makers just like us to create this sense of community and to bring us all together. We also listened to the mother/daughter duo of Koigu share their fiber story and welcomed us to join their team and collaborate to share the creative spirit. We had pizza, sat in groups and worked on our We Are Knitters kits and just enveloped our whole selves into the richness of being with “our people”. It was such a weirdly familiar feeling to be in a room full of strangers, but at the same time they’re not. 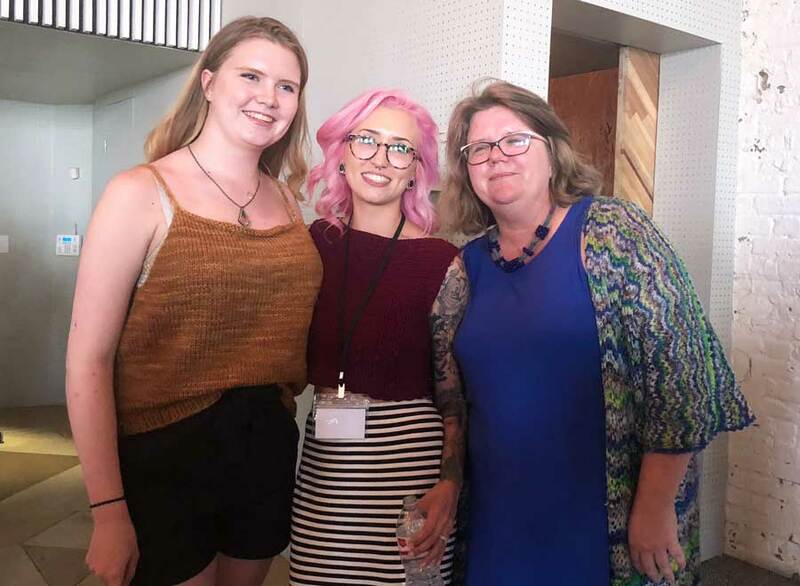 They’re friends, some have turned to family, some you may have never met or heard of, but still connecting so deeply because of such a strong similar interest in being a Maker and understanding the importance of human connection. 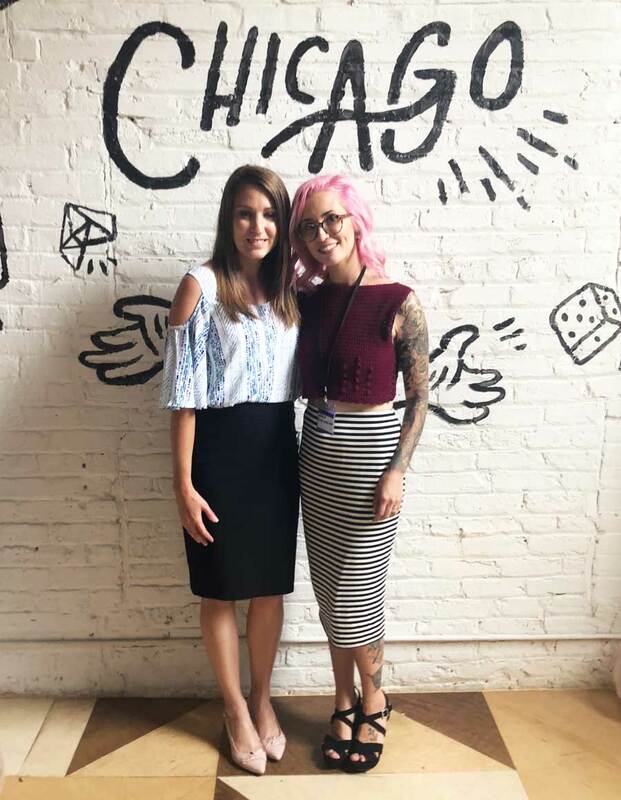 Our Maker Life Chicago was such an empowering and moving event that really made me leave feeling ready to stand tall in my endeavors and be excited and ready for the future, as opposed to my previous feeling of unsure and scared. These events really are life changing. Such a wonderful time meeting this amazing duo from Koigu! I know many of you who were unable to attend the event or missed the Instagram live (everyone can thank Vincent for holding two phones at once for 20 minutes), and I have some great news. Thanks to the Our Maker Life media team, we will have a quality version of the speech available soon and I’ll be sure to upload that here on the blog, as well as a text version of the speech (minus the last second changes nerves made me edit because I lost where I was on the cards). We got you, don’t you worry. To be frank, my speech is a whole lot of personal stories of my experiences in pain, neglect, being lost in my life and then how I overcame it all and learned to love myself. It was hard to talk about and you may notice my nose deep into my cards during certain spots and that was simply because I didn’t want to look anyone in the eye and realize I was saying this outlook to a room full of strangers. I do hope you all enjoy it, and I’ll be sure to let you all know when it’s up and ready for you guys. I hope you all can hear my story, my testimony and understand the power of perspective and are able to step away with a better understanding of self-made lies versus God-given truths. You are awesome. You are loved. You are worthy, and more than enough. Never forget that. After the event we went out with nearly everyone who attended and had a delicious dinner and walked around downtown with the city all lit up. A group of us ended up at a bar and were able to have more conversations that lasted longer than just a few minutes. HOW AMAZING TO CONNECT WITH PEOPLE WHO DO STUFF THAT YOU DO AND SHARE PROS, CONS, IDEAS AND THE LIKE AND BE ABLE TO HAVE IT RECIPROCATED?! So many amazing Makers, so little time. Sunday I was utterly EXHAUSTED from lack of sleep, overwhelming amount of emotions, jet lag and so much more walking than I am used to (it was NYC all over again.. my poor little legs.. HA!). 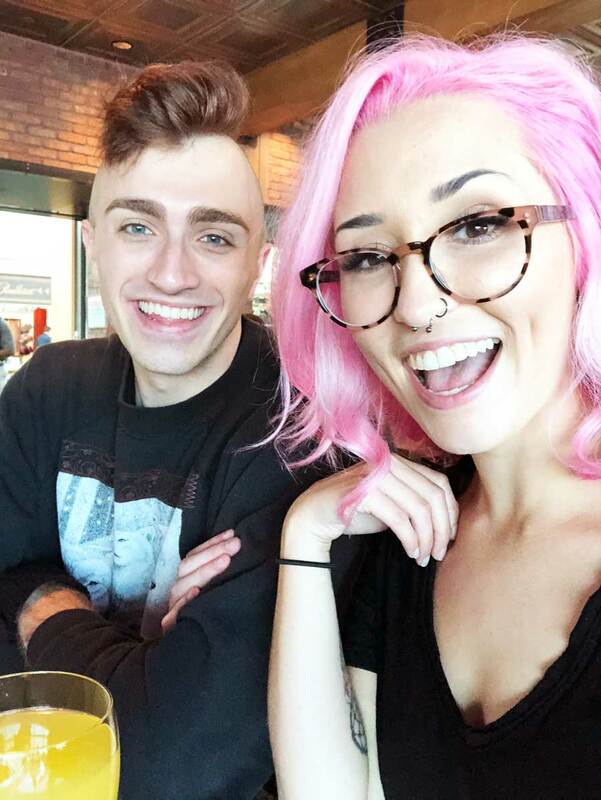 We hung out with @shannoncreates_ and @wanderingashtree and was able to connect even more while we roamed downtown Chicago and visited the Art Institute of Chicago. Being surrounded by generations old art, getting up close and personal with the delicate beadwork of these bold and time-intensive creations, to the precise chisel work of marble statues, to the unique and original ideas of old art turned new because of an artist willing to bend the rules and step out to allow the art to speak for their individual creativities. It was so inspiring as a Maker to really open up my mindset to being intentional with my designs, staying true to my own creativity and to not be ashamed of being different. So. Amazing. This here is Vincent from @visuvios_crafts - one HECK of Maker, let me tell you! After riding the blue line train from start to finish for an hour and fifteen minutes and walking into the O’Hare airport, we were told we were at the WRONG airport. We had fortunately decided to just go to the airport 5/6 hours early to just sit and rest so luckily we had enough time to order an Uber and drive across the city to Midway and still had time to spare, even if it wasn’t enough time to sit and chill. Though Vincent and I didn’t get to sit next to each other on this plane, I was able to sit next to an older gentleman who had a lot of wisdom and insight. We chatted often during the four hour flight back to Portland and even shared perspectives and ideas and found that we had a lot in common in the ways we view human behavior and how to begin healing ourselves. Come to find out, he was very familiar with my neck of the woods so I was able to connect with him in familiarity as well as in heart. It’s rather incredible what happens when we allow ourselves to break down the walls we build up and let strangers in and be open to hearing their stories and hearts. Ashley from @toastytribeshandmade wearing her Diamonds in the Rough Ruana top! Find the pattern here! We have so much in common but we never know that anymore. We put in our earbuds, make Face Time dates instead of pizza dates.. We ghost people instead of sharing our feelings because risking our vulnerability is out of the question. But this weekend showed me how important it is to reach out, to be an ear for others to share their stories and start their journey towards healing.. And in turn, “sacrificing” the vulnerability only builds us up while being that person for someone else. We can reflect on ourselves and understand that we are all human, and how we choose to show our humanness has a bigger impact than I think we understand. Let go of social ties, let go of worry, let go of every fear that holds you back from really delving into this world of humans and connections. Ok, ok.. sorry for RAMBLING for so long, but I really needed to share how powerful this past weekend was for me. I know I left a lot of stories out, but there is no way to really say all that happened without writing a literal book. Thank you to each and every single person who attended the event or contacted me prior, during and after to share their heart and self with me. Thank you to every person who came up to me and introduced themselves and made me feel so insanely loved and special. Thank you to the Our Maker Life team and volunteers for putting on such a remarkable event. Thank you to our entire community for being such an influence on me and for sharing your creativity with us. Thank you, thank you, thank you.. You all impact my life and encourage me to always strive to be better and the perspectives, lessons, and insights learned along the way may be harsh at some times, but they always lead to such brighter visions.